The Cleveland Art Museum is located in the University Circle area on the east side of Cleveland. Photographers and art lovers from all over the world enjoy viewing the museum’s 40,000+ pieces of art, covering photography, painting, sculpture, jewelry, ceramics, furniture, architecture and more. Outside the museum, a number of sculptures can be photographed with a tripod, giving photographers their best chance to get a great, detailed print. Inside the museum, tripods and monopods are not allowed. Obviously, it all depends on “what” it is that you want to portray. 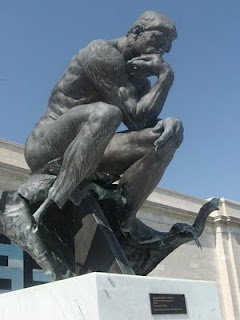 Are you looking to show the The Thinker’s muscles in the sculpture as shown in slide 5? If so, you better be up close to make sure those details really pop. Maybe you were initially impressed with the scene due to the statue’s placement in from of the museum’s entrance. In that case you would want to feature the statue but still show enough of the building to give it context as in slide three. Or perhaps, you really do want an overall view of the museum and the statue, showing detail in both. In that case you want to get as close as you can to still get detail in the sculpture and settle for as little of the building as you can to capture the overall scene you desire. In that case I would opt for the view shown in slide two. I think this is an improvement over Stu’s photo in that half the photo is not of the featureless sidewalk in the foreground. Obviously all five photos show Rodin’s statue, but each will probably deliver a different message to the viewer. It’s your job as a photographer to decide what message it is that you want to convey, and then put yourself in the proper place to capture that image. For the slide show, click here and scroll to the bottom of my article on Examiner.com.